Successfully Added Ninja Unlocked Phone Watch (Keypad + Dual SIM + Touchscreen ) to your Shopping Cart. Everyone needs a cellphone. Even Ninjas. But as a ninja, don't you find that your hands are always full? Whether you're swinging your nunchucks or have both hands wrapped around the throat of a ninja from an enemy clan...your hands are always occupied. And that's why traditional handheld cellphones just aren't any good if you're a ninja. And it's not that you haven't tried cellphone watches either, but that brings up another problem --- fancy metallic phone watches usually clash with your all-black garb. Because let's face it. The business of a ninja is stealth and you're not going to surprise anyone with a big clunky reflective silver phone watch on your wrist are you? Well Mr Ninja, we have just the solution for you. Feast your face covered eyes on this baby...The Ninja Phone Watch! Unlocked. With physical keypad just below the responsive touchscreen. And it has 2 yes TWO GSM SIM card slots. What's more Mr Ninja, you have the option of using the speakerphone or the elegant Bluetooth headset provided (best to keep your conversations stealthy). Once your battle for honor (indeed what other types of battle are worth fighting?) is done, kick back with some sake and listen to some tunes on your Ninja Phone Watch. 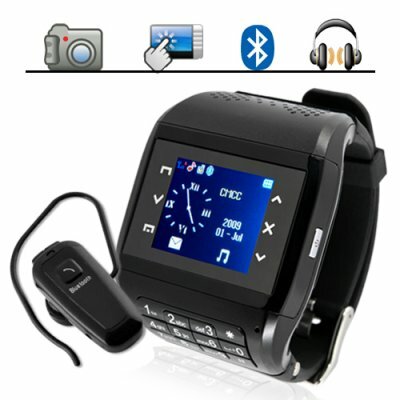 This awesomelicious phone watch is also a top of the line MP3 player and MP4 player. Now, let's say you have been hired to infiltrate a secret base or military installation. The Ninja Phone Watch also has an onboard digital camera and camcorder with microSD card memory (1GB card included free!) so you can take lots of classified photos and shoot lots of sensitive videos. So order your Ninja Phone Watch now and in a couple of days you'll be able to silently drop into your enemy's secret lair unannounced and still be connected to the ones you love. Brought to you by Chinavasion. Ninjas love shopping here. NO. This model mobile phone wrist watch is not waterproof because of its keyboard. The watchphone should be kept dry at all times. This phone does everything my blackberry watch does. This watch is worth the money! !